Welcome to the July Tour de Freaks Blog Hop! Although we usually have our hop on the 20th of the month, since many of our participants were in Salt Lake City enjoying the Stampin’ Up! convention so we delayed out hop just a little bit! But we are here now and ready to share our ideas with you! This month is a ‘free for all’ so you’ll be getting a little bit of this an a little bit of that! If you are going forward through the hop, you arrived here from Melissa Davies Rubberfunatics blog! What GREAT projects! I am just absolutely wild about the Wild about Flowers set so I decided to use it for my projects. I have a cute little card and matching mini gift bag for you! I remember seeing a very cool card made by our very own, very talented Wendy Weixler using some ‘frames’ as the background so I used that idea as a ‘theme’ for my cards. Cut out frames from Watermelon Wonder and Basic Black…I layered I think 5 different square framelits so I’d have different size frames to play with. Add frames to card front. Whisper White – 2 1/2 x 2 1/2. Stamp stem using Mint Macaron, flowers using Watermelon Wonder and greeting using Memento Black. 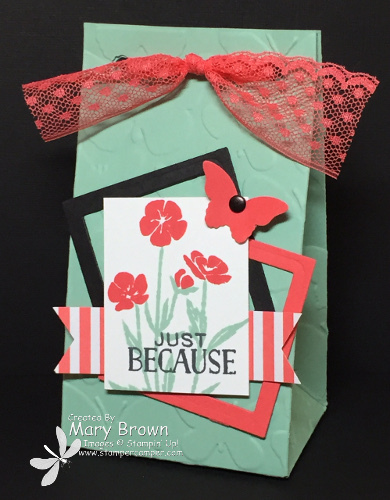 Cut out Itty Bitty Butterfly from Incolor Envelope dsp add to card front. Add some Basic Black Candy Dots to finish it up. So next up I made a cute little gift bag using the Gift Bag Punch board. Mint Macaron – 6 x 10 piece, punch and score. I folded along the score lines then ran through the Butterfly Embossing Folder. Put together. Add a Watermelon Wonder and Basic Black frame. I used the smaller ones that I had cut out. Whisper White – 1 5/8 x 2 1/8. Stamp stem using Mint Macaron, flowers using Watermelon Wonder and greeting using Memento Black. 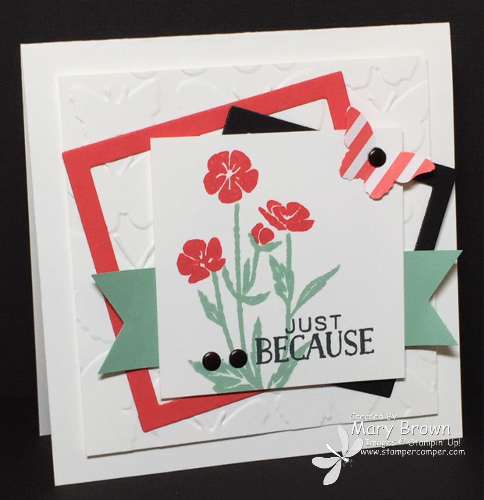 Incolor Envelope dsp – Watermelon Wonder piece – 3/4 x 2 3/4, cut into banner on both ends, add behind stamp panel and add to card front using dimensionals. 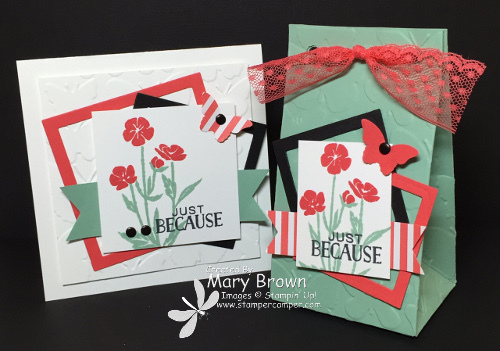 Watermelon Wonder – punch out Itty Bitty Butterfly, add Basic Black Candy Dot and add to stamp panel. Tie top of bag using Watermelon Wonder 1″ Lace Ribbon. And now it’s time to head over to LeeAnn Greff Flowerbug’s Inkspot blog. You are going to LOVE her projects! This entry was posted in Tour de Freaks and tagged Tin of Cards, Wild About Flowers. Bookmark the permalink.